Three pairs of well-worn roller skates. Eight trips to the RollerCon convention in Las Vegas. And more bruises than she can count. After its initial heyday in the 1950s and ’60s, roller derby enjoyed a renaissance in the early 2000s, and since then, flat-track leagues have cropped up nationwide. 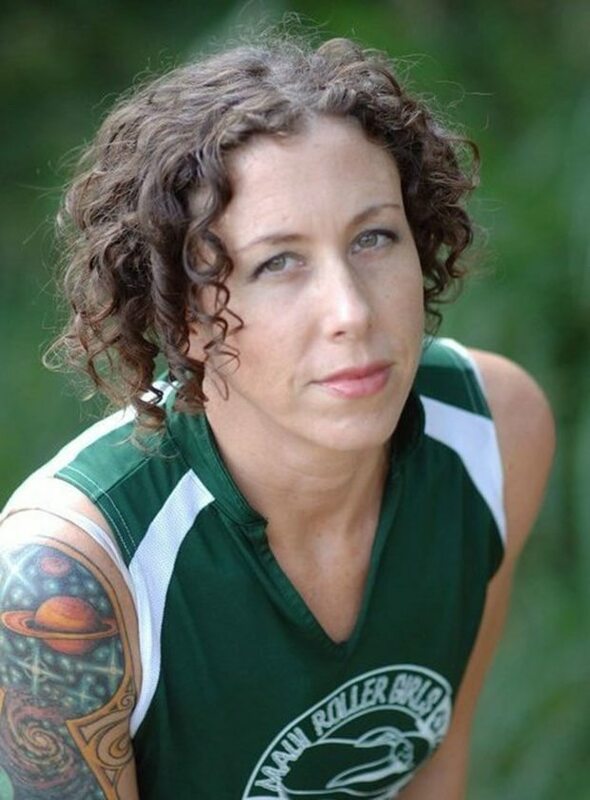 When Maui Roller Girls burst on to the scene in the spring of 2008, Gray became one of its first members. Looking back now, she says muscling her way around an oval track on eight wheels is something her younger self could never have imagined. “I wasn’t an athlete. . . . I’d never played on a team before. I was sitting there during tryouts thinking, ‘What am I doing here?’ “ she laughed. A few weeks earlier, a co-worker had called to tell her about an announcement she’d heard on the radio: A new roller derby league was holding tryouts in Kihei. “It sounded fun and interesting, so I said I’d go with her,” Gray recalled. Sarah “Sarassassin” Gray is one of the founding members of Maui Roller Girls, Maui’s first-ever flat-track roller derby league. Here’s a quick breakdown of how this fast-paced, hard-hitting game is played: In a series of short matchups (called “jams”), two teams composed of five members each — a pivot, a jammer and three blockers — skate counterclockwise around a track. The jammer scores points when she laps the members of the opposing team; the pivot and blockers try to prevent the opposing team’s jammer from scoring. In an impressive display of tenacity and teamwork, these athletes play offense and defense at the same time — and on roller skates. Ten years after her roller derby debut, Gray has hundreds of bouts — in Hawaii and as far away as Florida — under her belt and she’s captained the team twice. She currently serves on the team’s training committee and is the vice president of its board of directors (Maui Roller Girls became a 501(c)(3) nonprofit organization in 2012). Gray is also a member of Team Hawaii, which is made up of players from all over the state. 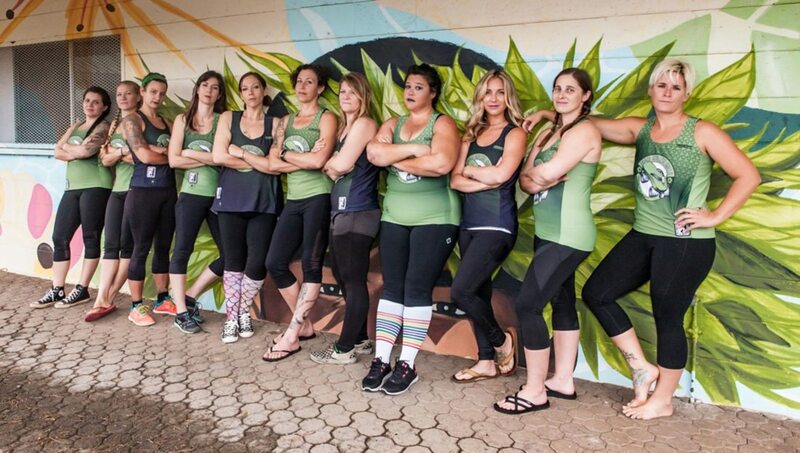 The members of Maui Roller Girls have proven themselves to be formidable competitors. It’s also a squad that knows how to have a good time, evidenced by their clever monikers, lively costumes and crowd-pleasing interpretive dance warm-up routines (one was set to Queen’s “Bohemian Rhapsody”). Maui Roller Girls’ eight rostered team members and eight rookies are tough-as-nails players who show off some considerable athletic and tactical skills out on the track. And don’t let the menacing pseudonyms and necessary roughness fool you — they may be fast and fierce, but these women also embody the spirit of friendly competition. “We know how to be competitive with respect,” Gray said. In fact, she says it’s not uncommon for members of rival teams to hang out before and after a bout or tournament. And behind each roller derby persona is a Maui neighbor. Gray is an office manager, special events bartender and beekeeper; her teammates include several teachers, a fishmonger, IT specialist, restaurant server and print shop manager. Players come from all walks of life, which isn’t all that surprising, given that roller derby is known for breaking the mold when it comes to diversity and inclusion in sports. For one thing, Gray said, “No matter what shape or size you are, there’s a position for you. You can create your own dynamic within the group.” And apart from the competition and camaraderie, players also gain self-confidence and build inner strength. That’s one of the many reasons why Gray and her teammates encourage amateur athletes of all stripes to give roller derby a try. Maui Roller Girls is a member of the Women’s Flat Track Derby Association, which insures the skaters, as well as their practice and bout venues. The team is actively looking to secure an indoor space — ideally, a warehouse with a flat-surfaced concrete or hardwood floor — for practices and bouts throughout the roller derby season, which runs from January to October. The team also holds fundraisers to offset the out-of-pocket costs of traveling to bouts and tournaments on neighbor islands and on the Mainland. To commemorate its 10th anniversary, Maui Roller Girls will face off against the Garden Isle Renegade Rollerz in a “birthday bout” Saturday at 3:30 p.m. at the Boys & Girls Club of Maui’s Central Clubhouse outdoor basketball court, located at 100 Kanaloa Ave. in Kahului. Doors open at 3 p.m. and admission is $5 per person; tickets to this family-friendly event will be sold at the door. For more information about Maui Roller Girls or to inquire about donor, sponsorship, volunteer or membership opportunities, visit www.mauirollergirls.com or email visitMRG@ gmail.com.